This large Folsom preform was found several years ago on the shore line of Sakakewa lake in Mountrail County, North Dakota just west of New Town. It was found in two pieces, four years apart. This Folsom preform was broken during manufacture when the second flute was struck. 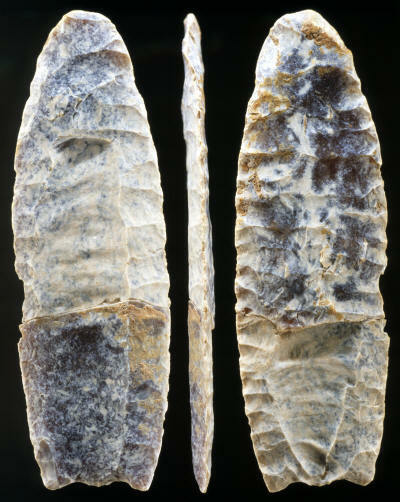 Failed preforms, like this example, provide archaeologists and flintknappers with important clues that allow them to reconstruct each stage of the manufacturing process. In this case a Folsom point. This Folsom was made from Knife River flint (silicified lignite) and it measures 4 1/16 inches (10.3 cm) long. This picture shows three views of the original Folsom preform from which the mold was taken. 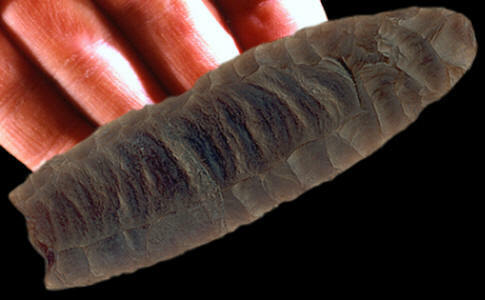 It shows the very heavy surface patina that has accumulated on the surface of the Knife River flint it was made from.